রবি বাংলাদেশে এই প্রথম 4.5G হ্যান্ডসেট কিনলেই ১০০% নগদ টাকা ফেরত! 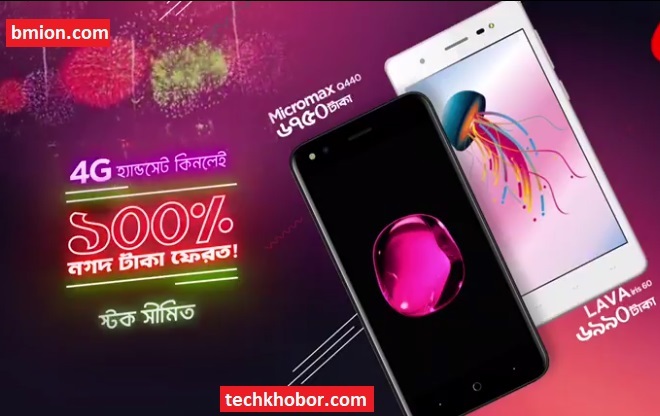 বাংলাদেশে এই প্রথম 4.5G হ্যান্ডসেট কিনলেই ১০০% নগদ টাকা ফেরত! Customer can buy the Lava iris 60 from any Lava retail channel. • What is “Taka Back” Offer? We are offering 100% TAKA Back offer with 4G smartphones, to get 100% taka back offer customer has to do minimum 6 purchases of Tk 299 bundle every 6 month cycle for 3 years period . In 3 years there would be 6 cycle of Taka back where per cycle is 6 months period. We will give Taka back at the end of every 6 cycle given that customer has fulfilled the criteria of minimum 6 purchases within every cycle. • What does the customer get? • Is there a Handset return condition for getting cashback? No, you do not need to return the handset. • When does the customer get the Taka back? Customer will get total cashback of Device Price within 3 years. In 3 years there would be 6 cycle of Taka back where per cycle is 6 month period. We will give Taka back at the end of every 6 cycle given that customer has fulfilled the criteria of minimum 6 purchases within every cycle. • Eligibility for Taka back? Customer can make 36 continuous monthly recharges of Tk.299. The customer will get a cash refund of Tk 1125 /Tk.1150 in 6 months on the device for 36 months. • What is the process of getting Taka back? Customer has to do minimum 6 purchases of Tk 299 bundle every 6 month cycle for 3 years period. • What are the benefits of 299 bundle? • After purchasing specific handset, customer will generate a successful chargeable voice call to any valid Local No to register for the campaign. • TAKA BACK offer will be split over a period of 36 months from the date of registration for this offer by tagging their Airtel/ Robi Sim in the Lava iris 60 or Micromax Q440 smartphone. • The Taka Back amount will be credited to the Subscriber as Cash which can be redeem from Robi Sheba or Airtel Experience Center. Customer will be notified through SMS when he will be eligible to redeem the cash back. • Package wise all other tariffs/benefits will remain unchanged. • This Offer cannot be combined with any other offer provided by Robi/ Airtel. This Offer is not valid for special, commercial or enterprise plans. • This offer is subject to modification based on changes in the business, legal and regulatory requirements and will be updated in website and other digital channel. We will make all efforts to communicate any significant changes to this Policy to you. • Robi will be entitled to postpone, suspend, modify or cancel the Offer or any aspect thereof, across the entire territories of service or any part thereof, at any time with or without notice, for any reason, including, but not limited to, acts of God, force majeure, technical difficulties, or any other reasons beyond Robi’s reasonable control. If Robi suspends or cancels the Offer, all aspects of the Offer shall be null and void. Airtel will not be liable to compensate any subscriber for any postponement or cancellation or for any reason directly or indirectly arising out of this Offer. • These Terms and Conditions shall constitute an agreement between Airtel and each subscriber and by subscribing to the Offer, subscriber accepts the same as binding upon him/her. • Robi has no liability whatsoever in respect of any claims or disputes and any resulting damages or losses, whether direct or indirect, relating to the customer availing, not receiving or customer’s use of the offer. • Robi makes no warranties or representations whatsoever in respect of the offer and the mobile services including as to its fitness for any particular purpose, merchantability, quality, availability, disruption or error free operation. • Please note that the statements in these terms and conditions do not constitute any general representation from Airtel regarding Airtel’s services or its availability. Airtel’s network and the provisions of the Offer is available on an ‘as is where is available’ basis and Airtel makes no representation, guarantee or warranty regarding the availability, fitness for any specified purpose or error free operation of the network. Network availability may be affected due to various reasons including force majeure, acts of god, inclement weather, topographical/ geographic/ demographic factors, maintenance work, availability of interconnection with other networks, etc.